Our Artisan collection of tiles is best described as sophisticated and timeless. Each tile is hand crafted in our factory by skilled craftsmen. Excess clay is carefully trimmed by hand once the tiles emerge from their moulds, before being coated in a glaze (mixed using traditional methods) and fired in the kilns. A soft colour palette is used: pale creams and off whites, minty greens and even a soft grey combine to offer a soothing but versatile combination of colours. The hues, such asWoodbridge, Ickworth, Sudbury and Dunwich, are named for the sleepy English villages which inspired the personality of these tiles. 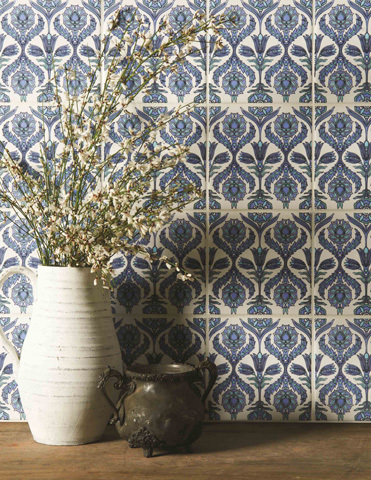 Gloss and crackle tiles are both offered in the Artisan collection, with each having their own appeal. Gloss tiles boast a softly reflective surface which, when tilted in the light, will show off the tile base’s softly undulating surface and rustic edges. It’s these small details that make Winchester tiles so special. Choose from 12 shades in a field, brick and half tile format, with matching moulding and skirting tiles to add that final flourish. Crackle tiles are available in six colours, with the soft crazed effect adding texture and depth. A choice of chunky and more refined moulding and skirting tiles are also offered. With versatility in spades, the Artisan range offers huge choice with just one rule – do what pleases you the most! The latest tiles to grace the Artisan collections add an interesting dimension to the range. 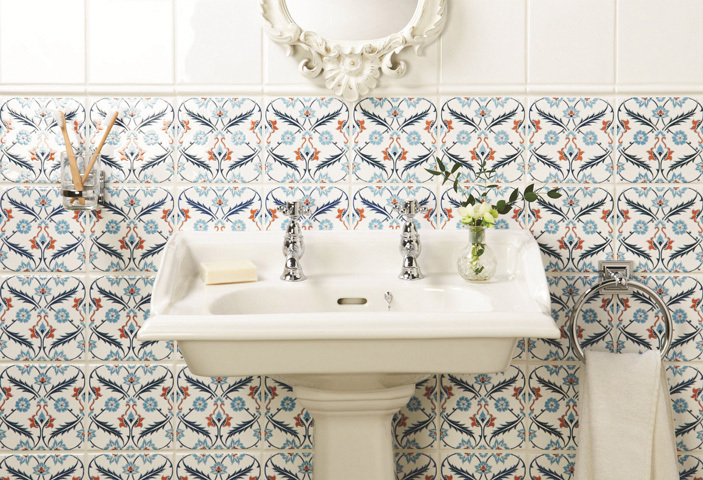 A bold selection of highly decorative tiles uses Mediterranean style patterns often seen in rugs and carpets. Applied to a crisp white tile base, the effect is amazing. Bright blues and reds pop against the light background, with every flourish and curve highlighted in beautiful detail. These designs certainly command attention and would look beautiful as a splashback in the kitchen or bathroom. Frame with crisp white tiles or complementary shades – the choice is yours.